This page gives news and information from some of the other Aylmers who have contacted me over the years – both those with the Aylmer name and others of the Aylmer line. Richard’s great-great-grandmother, Geraldine Maria Aylmer, married a Robert Constable Hall, and their offspring have been Aylmer-Halls ever since. 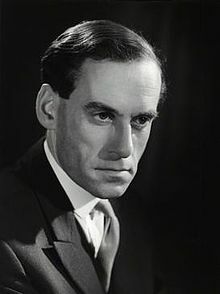 Richard was descended from a son, Norman; a daughter, Martha, became the grandmother of Jeremy Thorpe (1929-2014), the leader of the Liberal Party from 1967 to 1976. 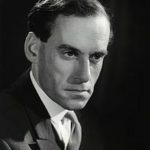 So the protagonist of one of the strangest episodes in recent British political history – the Thorpe Affair, which led to Thorpe’s 1979 trial and acquittal at the Old Bailey on a charge of conspiracy to murder, but irreparable damage to his reputation – bore Aylmer blood. The affair has been dramatised as A Very English Scandal, both as a book (John Preston, 2016) and as a BBC TV miniseries (2018). In a strange twist, Richard has also discovered that his greatx4-grandparents (not Aylmers) were also the greatx5-grandparents of the actor Hugh Grant, who played Thorpe in the miniseries! Robert lives close to the ‘Four Corners’ of the United States, where New Mexico, Colorado, Utah and Arizona intersect. His family story shows how the Aylmer name transmutates, perhaps as some try to simplify the spelling (indeed, on an earlier iteration of this page I placed an extra L in Elmore, which shows you how this can happen!) He understands that he is an Aylmer through family lore, which says his branch is descended from Bishop John Aylmer through one of his sons, Samuel Aylmer of Claydon, just north of Ipswich, the county town of Suffolk; he was in fact High Sheriff of that county. Samuel’s son Edward Elmer (sic) left England in 1632 for the New World and is believed to be Robert’s 8th-great-grandfather. Robert is undoubtedly connected to another Elmer through a different son, but would like to prove that he is an Aylmer through Y-DNA testing. Any Aylmer had that done? Let me know. Jan has researched the family tree of her husband’s father, George Frederick McGill. His Great-Great-Great-Grandmother on his father’s side was an Aylmer. She has found a newspaper clipping which refers to the marriage of George Morgan Goggin and Mary Ann Aylmer on 2 August 1828, Mary Ann’s father being given as Thomas Aylmer of Santa Croix and West Indies. This was the first Aylmer link that I know of with the West Indies. See also The Aylmers of Jamaica. The Adams ran the Thatchers Arms in Mount Bures, a lovely part of the county. 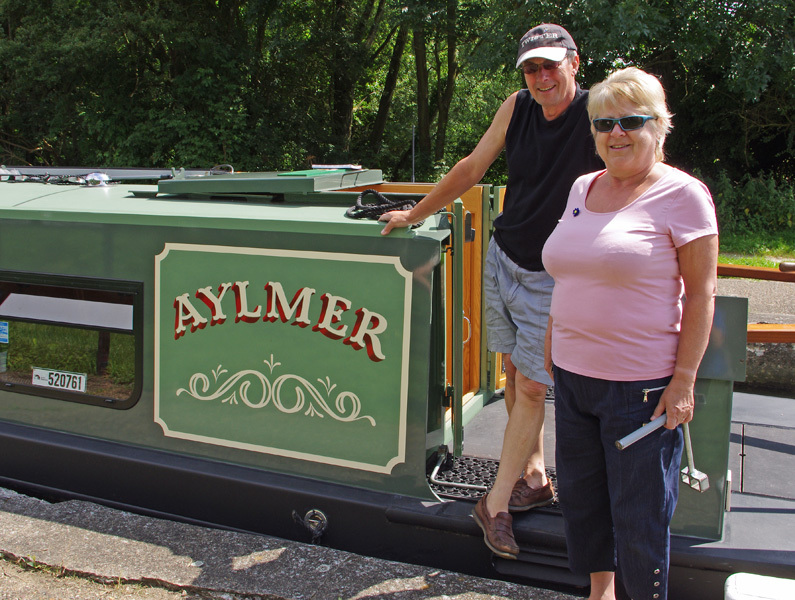 They have since sold the pub and in 2015 were enjoying canal cruising in retirement. 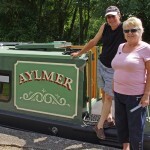 I met them in summer 2012 while walking on the River Stort towpath in the county; or, more strictly met their narrow-boat the Aylmer (pictured left). Several of their family have an Aylmer middle name to reflect their Aylmer heritage (though sadly not a surname). Roz comes from the Aylmer heartland of Norfolk. Her father Reginald, b1925, and his sister were born in Walsingham and he still lives nearby in Fakenham. Roz, her elder brother Roger and her sister Rachael grew up in Langham. All three places are just a few miles apart in north Norfolk. “The Alymers of Munster usually get their surname changed to Aylmer in official records but we in Limerick keep changing it back. Barry has also researched a significant Welsh family, the Almers. “Soon after the Domesday book of 1086, one Ithel ap Eunydd conquered the previously English-held region of what is now Gresford, in north-east Wales. The first of the family to adopt an English surname was John Almer, a marshal of the hall at the court of Henry VII (reigned 1485-1509). His surname came from the place where he lived, at Almer (now Almere) on the Welsh bank of the river Dee. See more at Places in Britain. “I noticed the daughter of one of my nephews in Tasmania, Shauna Aylmer, in your guest book. “We can trace our Aylmer clan back to Noah – Elmer, that is, believed born between 1795 and 1798. Family researchers have been unable to find information on Noah’s parents and any siblings, although family folklore is that he had sisters. Noah married Mary Bates, born 1796 in Langford, Bedfordshire, on 8 November 1819. Detailed information on Noah and Mary and their successors can be found on the World Family Tree hosted by Ancestry.com. Frank also contributed information about the Aylmer places in Australia and New Zealand. He passed away in February 2015. He had two children Tony and Frank by his wife Jean, and married Leah after Jean passed away. He was one of five siblings, three sisters (Mazie, Dorothy, Margaret), and one brother Laurence, father of John who is therefore also an Aylmer. Frank (above) is David’s father’s uncle, and Shauna is his cousin. In 2010 David completed a cross-country road trip from Vancouver to Halifax in Canada, visiting both Aylmer, Quebec and Aylmer Ontario and taking photos of Aylmer street signs in Montreal and Toronto. Some of the latter can be seen on my streets page. “When I began my genealogical and historical research, I imagined myself to be 50% Wiezbicki and 50% Collins (the surnames of my parents). “After developing the family tree for all branches going back to the early 19th Century, I now realize that I am equal percentages of all bloodlines in my ancestry, which should have been obvious to me already! In other words, I am as much an Aylmer as a Wiezbicki, Collins, McLinden, Sullivan, Donovan, Cleary, Pendrak, Maracz, Kurkul, etc. “My maternal grandmother’s maiden name was Josephine Veronica Aylmer. I have three relatives (an aunt, a first cousin, and a third cousin) who have “Aylmer” as their middle name. You see, my relatives thought it was a name worth preserving. David tells me that he has many cousins, mainly New Zealand based, who retain Aylmer as their middle name. He is a great-grandson of Rev William Aylmer. His own genealogical research shows that two sons of Bartholomew Aylmer (1452-1501) contributed to his ancestry, meaning that the baronets of both Donadea and Balrath and and the barony are represented. Glow has traced her father’s family history to Sir John Folliot and Elizabeth Aylmer. Through their son Edward (1609-90), an early emigrant to America, her family weaves through the SE United States. In Alabama, her grandmother (d.1951) married a man from Stockholm, and they begin a life in Chicago. Sorry, comments on this page are currently disabled following a spam attack. Please comment via other pages. Frank Aylmer from Townsville recently passed away unexpectedly on Friday 13th February 2015. He had three sisters (Mazie, Dorothy, Margaret)and one brother Laurence (my father). Frank had two children Tony and Frank and wife Jean. Frank remarried to Leah after Jean passed away. Thank you for letting me know John, and apologies for the late reply – I’ve not looked at the site for some time. I have made an update to the page. Family history tells me I am an Aylmer. I know Edward Elmer left England in 1632 for the New World. Unfortunately, his beginnings and family in England are vague. So how can I prove I’m an Aylmer? I’ve had my Y-DNA tested and know I’m an Elmer, connected to another Elmer through a different son. Have any Aylmers been Y-DNA tested? I would sure love to compare notes. We’ve been cut off from the Aylmer love for too long. I believe my heritage is Aylmer, family lore saying offsprings from Bishop John Aylmer 1521-1594. Has any Aylmer tested their Y-DNA? Hello Robert, finally got around to your comment, sorry it’s taken so long! I’ve combined your notes into an entry on the ‘Who we are’ page. Could you let me know which part of the US (or Canada?) you are from. Haven’t had DNA testing done myself, nor has any Aylmer that I know, but I’ve put a note on the page. Hope you and your tribe are well; there’s a good chance of an Aylmer link, as the name is so difficult to spell that it may well have been changed over the centuries. I’m the grandson of Admiral John “Jack” Aylmer and just found this page. Very cool! Will have to share with the rest of my family. A few things I’ve always wondered about your grandfather – where he saw service, which party/district he represented in the MA senate, and whether he is still with us. I’ll happily add more details of his career to the site if you have them. BTW my father’s middle name was Jack. Hi! I am Lena and I am another Aylmer. My last name has changed to the infamous Elmer. I come from bishop John Aylmers’ son Theophilus Aylmer. His eighth son and fifteenth child was Edward Elmer. He colonist that came to the new world on the ship Lyon with his wife and two children. So on and so forth here I am! My great uncle has done a huge amount of genealogy work on where the Elmer/Aylmer/Athelmer/AEthromer families came from. If you want to start looking at our history. I would start looking into King Etherlred 1 or the doomsday book 1086-reign of King William the Conquerer. Thanks Lena, I’ve made additions to the site on both the home page and the Bishop John page. if you’ve got more information about your family story, I’d be pleased to add that too – feel free to email me at peteraylmer at hotmail dot com. I do believe I might be one of the younger Aylmer’s in the US, I don’t know many other ‘millennials” with the surname. In Meath and lough counties during the potato famine era he was a coal miner. Michael’s parents were James and ann. james was born in 1790 and Ann in 1801. Even in England, Aylmer gets mis-spelt all the time. I spell it out for people routinely and they still put the l and the y the wrong way round. I don’t have any more info yet on your family but will share it if any comes in. Hello folks, I am Stephen Alfred Elmer. Father Frederick Louis Jr. and grandfather is Frederick Louis Sr. Next is Louis Elmer and then Calvin Elmer —— Elijah — Jacob — Hezekiah — Edward 2 —Edward 1. We’ve been able to jump brick walls here in the states, but are land locked in North America, specifically within the borders of the U.S. and limited to Elmers and Elmores who already have some connection to Ed. We’re certain we have genetic cousins in New Zealand, Australia, Ireland, England and Canada and would like to find them so we can learn more about our extended family migrations. Y DNA testing is the easiest way to start, but it can be daunting for people to jump into. I’m hoping we can find interested men or people who have the ear of Aylmer, Elmore and Elmer men who are not directly connected to Ed Elmer so that we can send them a free starter Y DNA test. This would be a small test that would initially just show whether a man was related to the U.S. Ed Elmer boys but would be a good first step in a longer more informative journey no matter the outcome.